Ireland have defeated Australia 20-16 to win the summer test series 2-1 in Sydney this Saturday morning. The game, which took almost two hours to complete, saw Joe Schmidt's side win with five penalties and a try from Munster's CJ Stander. In what was a titanic battle, Limerick's Keith Earls and Conor Murray were to the fore as always and will now deservedly take a well earned break following a hectic season. Following some intense defending from Ireland, they gave up an easy three points to Bernard Foley after Ireland were deemed to have been offside. (3-3). Australia were then dealt a huge blow as captain Michael Hooper was forced off injured in the 15th minute, having picked up an injury while attempting to perform one of his trademark poaches. A few minutes later, Ireland were reduced to 14 men for 10 minutes, as Jacob Stockdale was sin binned for leading with his forearm while carrying the ball into Nick Phipps' throat. The subsequent penalty was kicked once more by Foley to leave the Aussies 6-3 up after 22 minutes. Ireland's response to being down a man and down three points was to take control of possession and take Australian through the phases. Stander, Furlong and O'Mahony lead the charge as Ireland almost crossed the white wash, only for Devin Toner to knock on short of the line. Ireland regrouped and with less than two minutes left on the sin bin, they were rewarded as Johnny Sexton made it 6-6 from the tee as Australia once more showed ill-discipline, tackling Conor Murray at the back of the ruck. 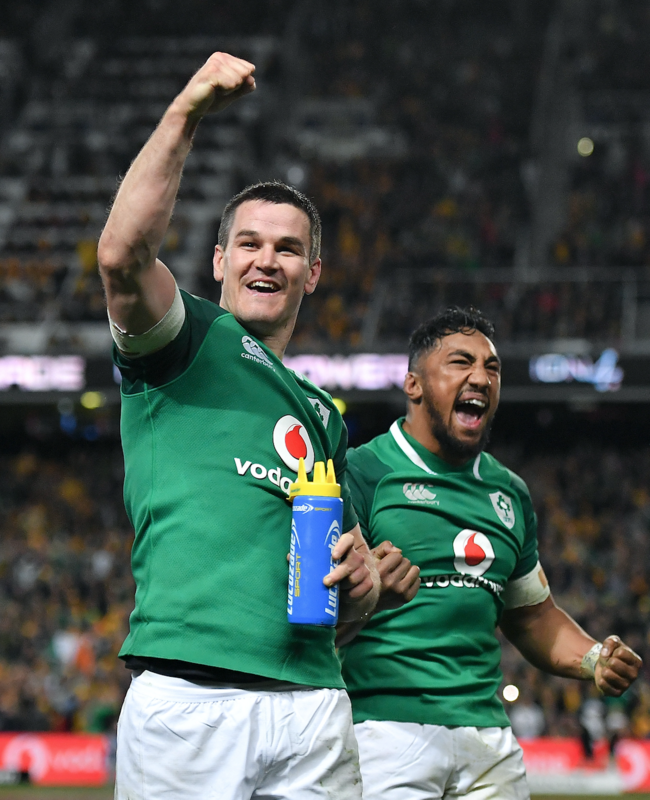 The referee was once more to the fore after 30 minutes when Israel Folau tackled Peter O'Mahony in the air causing the Irish captain to fall on his neck and leave the field injured (replaced by Jordi Murphy). Folau was sin binned for his efforts, but it could so easily have been a red card. With the game now firmly in the balance, Ireland were next to add scores to the board as Johnny Sexton knocked over another three points following another offside from Australia. The pressure brought by Conor Murray sniping at a ruck on their line, forced the hosts into yet another poor decision defensively and Sexton was on hand to make it 9-6 to the tourists. Much like Ireland before them, Australia responded well to being a man down, with Foley kicking them level at 9-9 with the clock turning red for half time. Ireland's restart, a perfectly weighted kick by Sexton, saw Haylett-Petty knock it on, before Samu Kerevi picked it up in an offside position. As the hooter sounded, Sexton kicked Ireland into a 12-9 lead. More than Joe Schmidt's men deserved. Ireland began the second half as they ended the first, with CJ Stander crossing for a try from a rolling maul following another penalty against Australia on their own line. (Their 11th of the game after just 45 minutes) With Sexton missing the conversion, Ireland led 17-9. The next nine minutes, were all green and gold. The home side came back into the game by holding on to possession in the Irish half for multiple phases, before Foley dropped a grubber kick in behind the hard working Irish defence and Koroibete was on hand to touch down, despite the effort of Rob Kearney. When Foley added the points, the tie was down to a one point game. 17-16 to Ireland after 55 minutes. The following 21 minutes of the game, up to the 76 minute were as intense a period of play that the test series had shown. Ireland were under severe pressure from Australia, who through a series of knock ons and one massive counter ruck, could not penalise Ireland with points on the board. As the clock ticked to 77 minutes, Ireland won a penalty and worked a maul from the resultant line out. Australia's Tolu Latu was adjudged to have not released following a carry. Sexton kicked the resultant kick from just outside the 22 metre line on the left hand side of the posts, making it 20-16 with 60 seconds on the clock. With the clock in red, Australia went for the winning try. A pass from Foley, looked to have touched Stockdale's hand, but the TMO confirmed he did not touch the ball (He did not have any clear evidence). As the the big screen showed the clip, a massive Irish crowd inside the ground roared their approval as Ireland secured a first series win in Australia since 1979.